Today I found out what exactly a pony truss is. I had heard the term before, but never understood what it meant. In fact, it is quite simple. A pony truss is a truss bridge which allows traffic through the truss, but the top of the bridge is not joined together with cross braces. Any truss bridge can be a pony truss. But not many are being made anymore, so chances are small that you will actually see one. There is a bridge outside Booneville, AR. On Hwy 23 that has been described as a lost pony truss bridge. What is that? Washington State has an 86 year old Pony Truss bridge that they’ll give away for free. Thanks for sharing. I sincerely hope that someone is able to find a suitable use for that historic bridge. I’ve shared this to the Bridgehunter website. 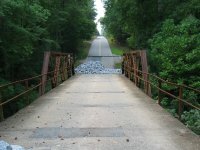 Actually, Pony truss bridges are still being made and build, just most of them are secondary road that most do not travel. It also depends in the climate and what state you at in, and of course, your state’s designer.